The variable Time provides the time to breakdown in minutes, and the variable Voltage provides the voltage level at which the test was conducted. These data are not censored. 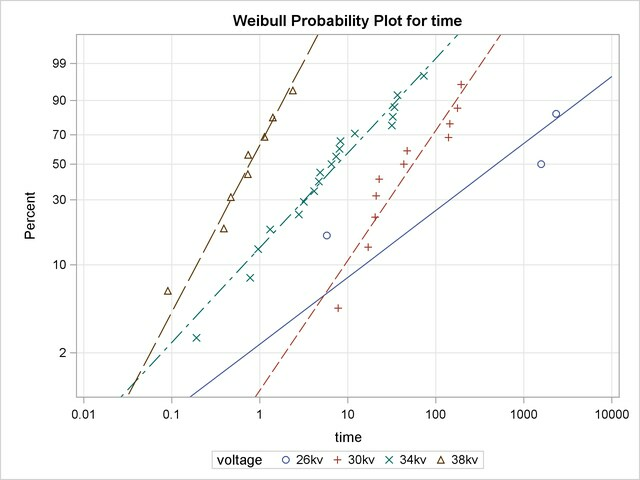 The RELIABILITY procedure plots the data for the different voltage levels on the same Weibull probability plot, fits a separate distribution to the data at each voltage level, and superimposes distribution lines on the plot. The input data set FLUID is specified by the DATA= option in the PROC RELIABILITY statement. The PROBPLOT statement option OVERLAY specifies that plots for the groups are to be overlaid rather than displayed separately. The option NOCONF specifies that no confidence bands are to be plotted, since these can interfere with one another on overlaid plots; confidence bands are displayed by default. A summary table that contains information for all groups is displayed. In addition, information identical to that shown in Figure 12.3 is tabulated for each level of voltage. The summary table for all groups and the tables for the 26kV group are shown in Figure 12.6 and Figure 12.7. Algorithm converged for group 26kv.